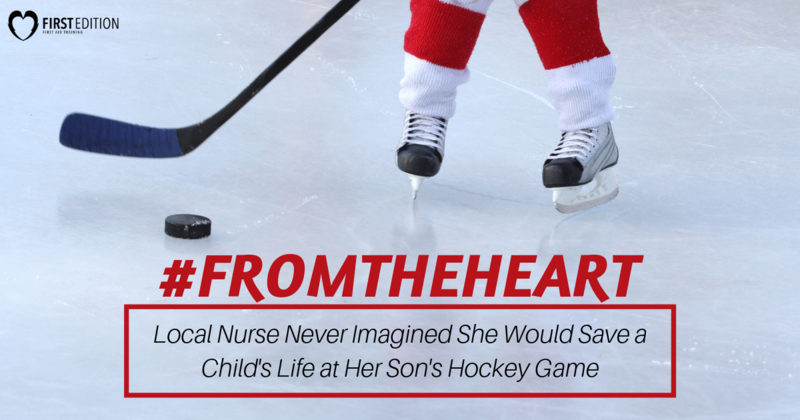 #FromThe Heart - Local Nurse Never Imagined She Would Save a Child's Life at Her Son's Hockey Game - First Edition First Aid Training Inc. Saving a life is truly an exceptional act. A person’s life is in danger and through the kindness and assistance of friends, family, or the strangers nearby, they can be saved. At First Edition, we applaud those who take action, jump in, and apply their first aid skills and knowledge to help someone in need. It is only through first aid training and AED placement in public locations that more lives can be saved. Recently, we had the pleasure of speaking to one of these heroic individuals – Melanie – who happened to be in the right place at the right time, with the knowledge that put a heart back on track. Thank you for sharing your story with us Melanie! Can you tell us about the time you used CPR and an AED to save a life? “On December 23rd, our hockey team was playing our first of two back to back games in our small community,” says Melanie, “I believe we were just under 10 minutes in the first period of the game when we noticed a child was down on the ice. As spectators we often assume it was a trip, fall or collision and were waiting to see what the call was. The trainer from the other team was assisted to the child’s side where he immediately noticed the child was in distress and called for help. Myself and two other moms, all of us being Registered Nurses, ran to the ice and were escorted to where the child was laying… the one parent was a family friend of the child and he had said he was having weak spells and seizure-like spells and was currently being worked up for a seizure disorder and possible hypoglycaemia or low blood sugar. The child appeared as though he could be having a seizure, and the thought process to protect the airway and protect the child from injury was my first thought and I believe that of my counterparts. I must say that everything that occurred in this time was all a team effort. There were many present who were volunteer firefighters and trained in first response. The AED was brought to us without asking, someone just sent for it. The child was not moving air well, we were having difficulty finding a pulse. It was a challenge to remove his equipment to apply the AED pads. The machine voiced ‘shockable rhythm detected stand clear.’ We all stood clear and the button depressed. My colleague took the lead with chest compressions for about a minute followed by 2 rescue breaths from myself. We had barely started the second round of compressions when the child’s colour went from a dusky blue to a pretty pink, and he started to regain consciousness. The fire department hand arrived, followed by the ambulance around that time. The child was taken to the nearest hospital and then quickly flown to the nearest Children’s Hospital. It was reported back to us that he was doing very well, and the Doctors taking care of him were surprised how well he was doing and attributed it to our quick response on the ice, and the use of an AED device. With the information from the AED device, the Doctors determined he had sustained a sudden cardiac arrest, and his heart was fibrillating at 250-300 beats per minute (which fortunately is a shockable rhythm). Had you ever used an AED before to save a life? Are you certified in First Aid and CPR? In your opinion, who should have an AED? Where should they be located? What is one tip you would give someone who might end up in a similar situation? Cardiac arrest and other heart-related emergencies can occur at any time, to anyone, of any age. It is necessary that AEDs are accessible to the public so that they can be used immediately, such as the situation Melanie found herself in. If it weren’t for the nearby AED, the story may have had a crueler ending. We want to thank Melanie for sharing her story with us as well as for making a difference by knowing what to do to save a life. Her actions truly come #FromTheHeart! Do you have a lifesaving story to share? Have you experienced a cardiac arrest and been saved by a good Samaritan? We would love to hear about it! Send your story to info@firsteditionfirstaid.ca for a chance to be featured on our blog or use the hashtag #FromTheHeart to share your story with us!